Can you believe we had never taken The Phi to a miniature golf course? I know! The last time I can remember going mini golfing was when it was rainy and I was pregnant with The Phi. So I guess we did take her...in utero. So I don't think that really counts. 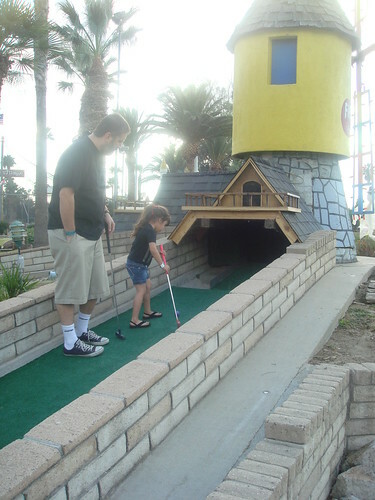 PR Dad claims to have once played the pro mini-golf circuit. But I think he was just trying to impress me. And it totally worked. I was all swooning over his mini golf skills. So we took The Phi to some ghetto golf course for some unlimited mini-golfing. Of course she had a blast! My Pops plays real adult golf. Like the kind without windmills and castles and where you need more than one club. I know he would love it if one of his grand kids is the next Tiger Woods. The good news is you have 3 other grand kids. She's my Tiger Woods no matter what. Ghetto golf course? I would love to have something like this to take my kids too. You don't know ghetto until you've seen the mini golf course my town has to offer. Nothing but twisted metal traps to piss you off. Extremely ugly! And the weird thing, the locals eat this up! as we watched the video lili started a "you can do it day-day" chant! i like how she doesn't get upset or give up.